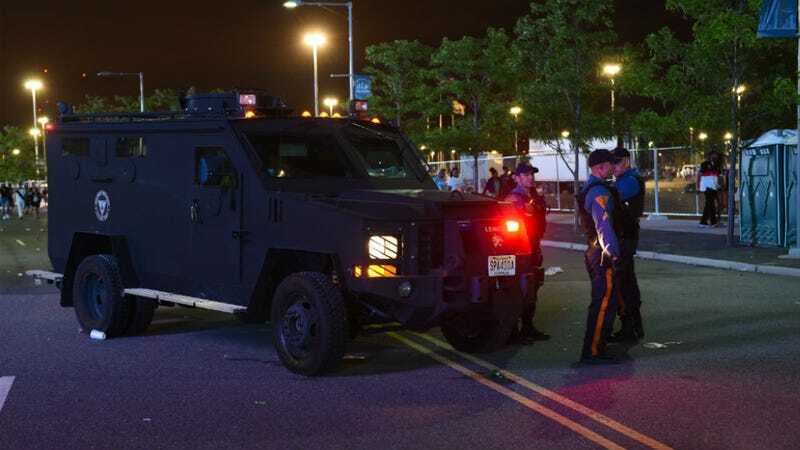 New Jersey State Police, dressed in riot gear and driving armored military vehicles, deployed tear gas into a crowd trying to make its way into MetLife Stadium for Hot 97’s Summer Jam concert Sunday night. Witnesses say the disturbance began around 7 p.m. due to an altercation between concertgoers. That’s when officials shut the gates to the show, the Hot 97 Summer Jam at the MetLife Stadium in East Rutherford, causing a logjam of people at the MetLife gate, which in turn led to metal barriers being toppled and thrown. After concertgoers began throwing bottles in response, police then took up a defensive V-shaped position in front of the stadium gates as a barrage of bottles pelted the officers. An armored State Police vehicle came into the middle of the crowd and activated a piercing alarm to try to disrupt the crowd of about 1,000 people. Summer Jam has been a cornerstone of hip-hop for more than 20 years, both as a New York City-centric forum and a barometer for the nation. (This year, Kendrick Lamar headlined with his TDE crew; other performers included Nicki Minaj, Future, Meek Mill, Fabolous, Ma$e, Lil Kim, Remy Ma, and many more. Also, 50 Cent and French Montana squashed beef.) But while the concert has had its fair share of chaos in the past—most notably, the chair-throwing incident of 2003—this may be the first time attendees have ever been tear gassed. As it happened, reports and photos emerged on Twitter. Due to strong demand for tickets for Summer Jam 2015, the show sold out early this evening. When fans realized tickets were not available at the box office, a small number of people created an unsafe environment, and for the safety of all guests, the New Jersey State Police were on scene to disperse the crowd. The gates were closed at that time. No further entry was permitted into the event.For ticket holders whose tickets were not scanned, refunds will be offered at the point of purchase.